US fast food companies in China are caught in yet another food safety scandal. It was a bad week for the crown jewels of the U.S. fast food industry. At the end of July, Louisiana-based Yum! 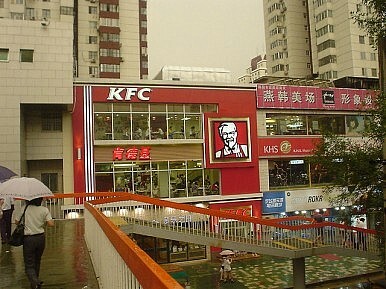 Brands, which owns Kentucky Fried Chicken and Pizza Hut, discovered (along with McDonalds, Subway, and Starbucks, among others) that one of their suppliers in China, Shanghai Husi Food Co., a subsidiary of the Chicago-based OSI Group, was supplying them with products using expired or rotten meat. Unfortunately, this was only the latest in a number of food safety scandals that have plagued U.S. fast food companies in China over the past few years. There are several possible takeaways from this most recent food safety scandal: first, bravo to Dragon TV for uncovering expired meat being served at KFC and McDonalds; second, this scandal reflects a deeper, more systemic food safety challenge in China; and finally, multinationals take advantage of lax Chinese food safety regulations and enforcement to do the wrong thing and/or multinationals continue to receive a disproportionate amount of attention from the Chinese media and officials when it comes to investigation and exposure of wrongdoing. It is likely that there is truth in all of these assessments. It is, in fact, terrific that over the past decade Chinese journalists have become true investigative reporters, whether uncovering violations on food safety, environmental pollution, or corruption. Segments of the Chinese media are rapidly becoming an essential element of China’s capacity to enforce regulations across the full range of issues that are most important to the Chinese people. There is no doubt that this is only the tip of the iceberg with regard to food safety issues in China. Shanghai, where Dragon TV is based, is a leader in food safety. It was the first city to introduce a local food safety law, the first to conduct food risk assessments, and the first to establish a public hotline for food safety violations and complaints. It also is the birthplace ofZhichuchuangwai (Throw It Out the Window), China’s first non-governmental organization devoted exclusively to addressing food safety violations. No one should assume that Shanghai is an epicenter of food safety issues: China’s food safety problems are systemic, and Shanghai is simply more transparent and aggressive about addressing its problems. Where does all this leave the U.S. fast food companies and their suppliers? First, unsurprisingly, they are taking a financial hit. KFC and Pizza Hut are both reporting “significant, negative” damage to sales. Second, this scandal is yet another wake-up call, reminding multinationals once more that they should and, in fact, must be above reproach. By now, all American fast food companies know the weaknesses in the Chinese food safety supply chain and, if they don’t, they should read the post by my colleague Huang Yanzhong this time last year that lays it all out for them: Chinese food safety inspection and regulatory enforcement are lax with too few inspectors for the job; multiple organizations have responsibility for aspects of food safety enforcement leading to different sampling and test results; and food safety data are not collected and analyzed in a systematic manner. In addition, until China’s own food safety regime improves, U.S. companies will need to shoulder more of the burden by providing their own independent inspections and audits all along the supply chain. Of course, this won’t be easy. In Shanghai, alone, over 70 percent of the food products come from different regions in China. Walmart, for one, has begun this process. According to Caixin, Walmart reported that in 2012, it “conducted 894 examinations of suppliers and more than 6,000 professional inspections of their suppliers’ food.” There is also the option to shift the sourcing of the food: McDonald’s has already announced that its restaurants in Japan will now be getting their chicken from Thai suppliers. Finally, U.S. companies should take the lead in educating their suppliers on food safety practices and partnering with local food safety commissions to strengthen enforcement capacity across the board. Multinationals have been strong supporters of Chinese civil society activity related to the environment through education and training; similar opportunities should be developed in the arena of food safety. As one Chinese netizen commented, “Compared with Chinese food, I would prefer Western fast food.” Now it’s time for the multinationals to step out in front and live up to this faith that has been put in them.